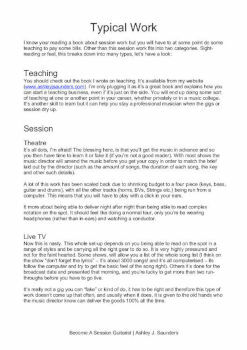 So if you've ever wondered how to become a session guitarist, then this is the ebook for you! If you admire session players like Tim Pierce, Pete Thorn, Tom Bukovac and Paul Jackson Jr. And dream of becoming just like them, then this is the eBook for you. 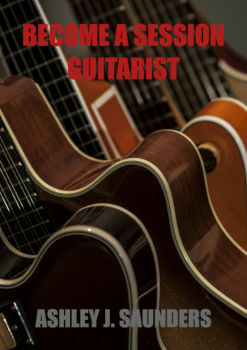 In this eBook, you will discover how to become a session guitarist. The types of work available including recording dates, touring, theatre work and more. We'll explore how to make a living from being a gun for hire and what it takes to reach the top. I'll explain how good a guitarist you have to be to actually get work and the steps you can take today in order to become good enough. We will also talk about equipment and what are the essential pieces of gear you will need to get started. Hint, you actually need less than you think! You will at some point have to audition, I will talk you through how to prepare and what to expect. We'll also deal with overcome rejection as you will experience this often. 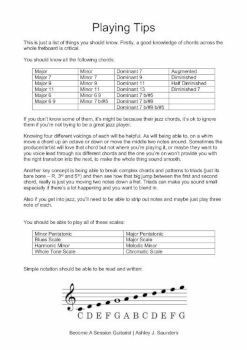 By the end of the eBook, you will have a roadmap for becoming a better musician as well as some ideas on how to get more gigs and turn your dream into reality. 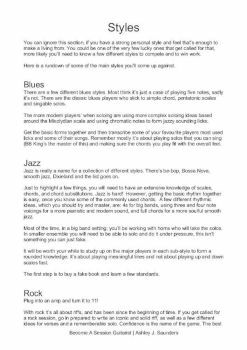 If you want to get into session work or have done some, then this eBook will provide you with a roadmap to become a top session guitarist.